This weekend I’m attending, for the first time, the Saints and Sinners Literary Festival in New Orleans. In its 15th year, this gathering of LGBTQ writers has become one of the premier events of the queer literary world. Today, I presented on a panel discussing Queer Fiction as Social Commentary with authors Matthew Griffin, Nick White, and Felice Picano, and moderated by Barry McCrea. We had a lively discussion. I learned a lot from this engaging panel of superb authors. I was particularly happy to meet Felice, a legend in the queer lit world. In the afternoon, I participated in the reading series with Kathleen Archambeau, Peter Gajdics, Mary Griggs, Mercedes Lewis, Jeffrey Round, and Vanda. What a wonderful experience it has been meeting and getting to know so many amazing writers. I thank my publicist Michele Karlsberg for connecting me with this wonderful event and to Festival organizer Paul J. Willis for scheduling me as a panelist and reader on my very first visit. I look forward to Sunday’s events and will be sorry to see the weekend end. But I’ll be back! Here is video of my reading. 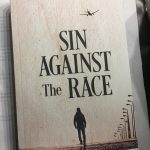 I read excerpts from Sin Against the Race. Enjoy! © 2018, gar. All rights reserved.